A lot's been going on here and at my column for the San Francisco Chronicle. I just got back from a day learning about my figs and how they're preserved by drying (but that we will deal with much later) For now, I wanted to share with you some of my recipes from the column that I've been cooking up, a little savory and a of course, a little sweet! There's a prawn and chorizo pulao inspired by Goan chorizo (and what I do since it is practically impossible to find outside India), a look back at San Francisco's Oyster Loaf with my special take with a bit of semolina, an easy toasted naan and tomato salad and of course, dessert, this roasted summer sweet corn custard tart with cardamom. Come summer and I lean towards ice cream and cold sweet things but also towards smaller dishes that I can snack on versus larger meals. Dips can become a meal especially with a colorful assortment at the table and if you include a few different types (keeping in mind your diner's preferences) you could end up with a gorgeous spread of tastes and aromas begging to be eaten. I'm had a great time with the class audits at the culinary school. Though, I was a silent observer, it was a great opportunity to see how the classes at the school are taught, talk to students in the program and get to know the instructors a little bit. It gave me good food for thought on what culinary school might entail. An extra bonus was to watch some fun and interesting pastry techniques in action. One class was busy preparing laminated doughs for an upcoming test and the students work so fast while keeping the butter cold to get those flaky layers. The advanced class had students making entrements with apples. Making laminated doughs from scratch intimidates me, something I need to tackle at some point! I blistered the naan to give it that characteristic charred flavored in the pan before loading it with fresh mustard greens and spices. Paneer is a different from the regular kind of cheese, it holds it shape rather well and does not melt but in this pizza-style dish, you want a little bit of a hot and melty cheese dripping all over in every slice. I added a little mozzarella to get that much desired melt that my taste buds were craving and seasoned the pizza with a few spices, cracked a couple of eggs and stuck it into the oven to bake for a few minutes. 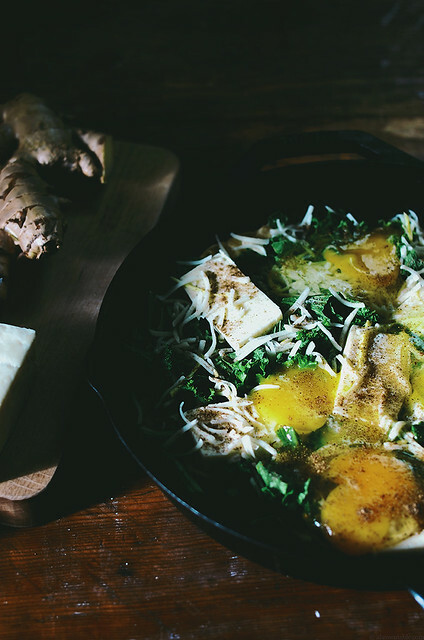 Greens, eggs and cheese with a few spices and naan, this makes a good breakfast, lunch or dinner! I let the naan dough rise in an oven that was preheated for 10 minutes at 200F. I shut the oven once I place the dough inside. You can use any type of green here, kale, spinach, fenugreek etc. By tossing the greens in oil, the leaves will hold their texture and not dry out as much during baking. 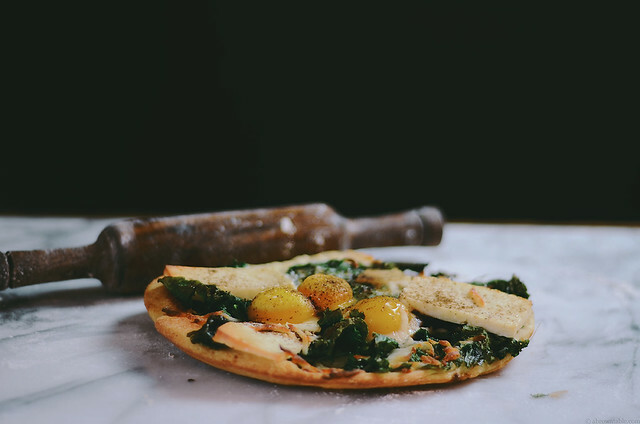 Don't expect the rich creamy gravy from saag paneer here, I've skipped all of that heaviness to make this pizza lighter. I've tried mozzarella and gruyere here but feel free to play around with the cheeses. You could also use the entire dough and fill a pan up to get a deep and thick crust. I find half the dough per 10 inch pizza to be just enough. 1. Place the flour, yeast and salt in the bowl of a stand mixer. Dry whisk with a fork to mix the ingredients lightly. Attach the dough blade to the stand mixer. Add the rest of the ingredients to the bowl along with the two tablespoons of oil. Mix the dough on low speed for about 3-4 minutes until the ingredients just come together and then increase speed to medium-high to form one large sticky ball. Place the dough in a large well oiled bowl. Cover the lid with cling film and place it in a warm place to rise for 2-4 hours. 2. Once the dough has doubled in size, remove and transfer the dough to a clean surface (pastry board). 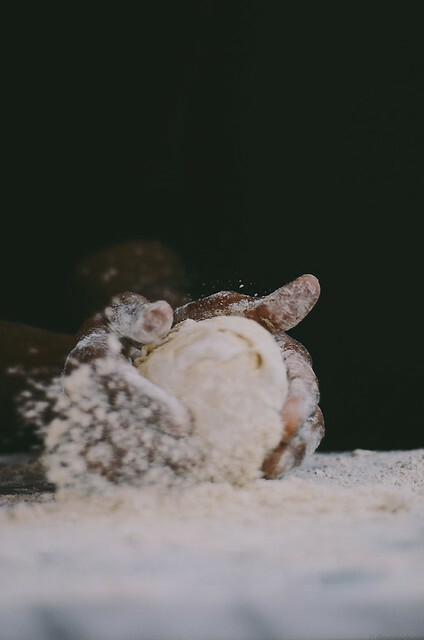 Dust the dough with a little flour and using your hands shape it into one large ball. Divide the ball into half. Then take one half and roll it out into a rough 10 inch circle dusting with a little flour. Repeat the same with the remaining half of dough and keep aside. 3. In a large mixing bowl, mix the greens with ginger and garlic along with the olive oil. Keep aside until ready to use. 4. Place a wire rack in the center of the oven and preheat the oven to 350F. 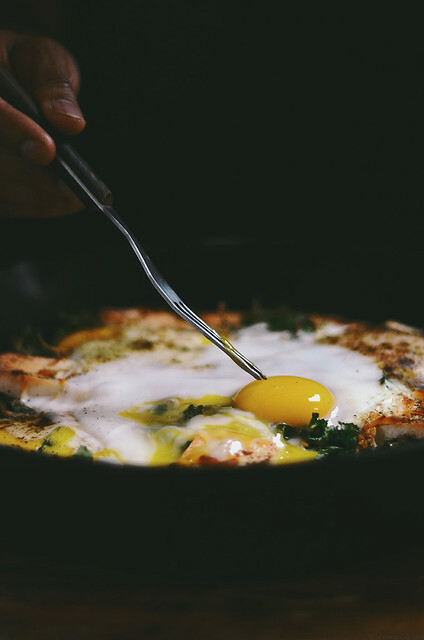 While the oven is heating up, add a little oil in a large 10 inch skillet pan with a lid on the stove on medium-high. 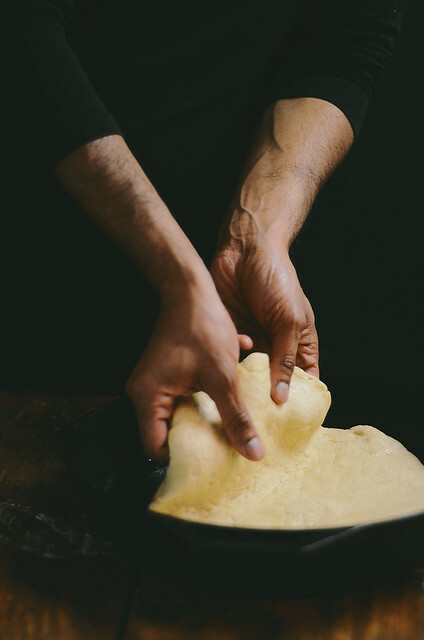 Slap one naan on the hot skillet and cover the pan with a lid for 2 minute. Then flip the bread over and cook for 2 minutes covered with the lid. Remove the skillet from the stove. Layer the naan with half of the mustard greens mixture. Layer with paneer and mozzarella. Crack 2-3 eggs in the center of the naan and add half of the garam masala, coriander and half of the salt. 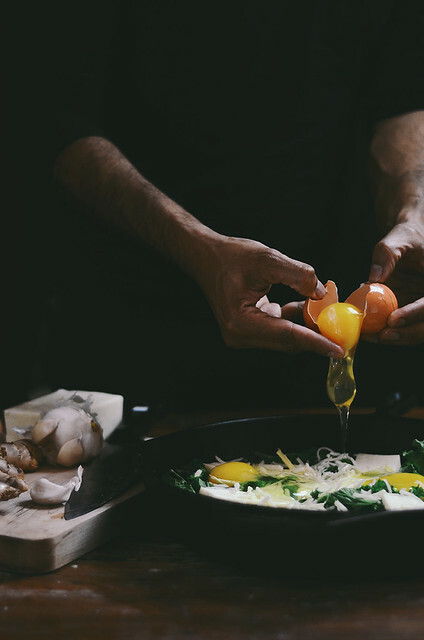 Place the skillet in the preheated oven and bake the naan for another 5-8 minutes depending on how you like your eggs cooked. I like the egg whites to be just set and the yolks runny. Check the oven while the bread is baking. Prepare the second naan similarly. Serve hot.